Are all banks the same? This is a question people ask me all the time…and it’s not an easy one to answer, but using your reviews, we can have a go at answering it. We've focused on the ‘Big Four’ banks. Why? Well, because they dominate the banking market in the UK - they have 77% of the personal current account market and 85% of the business current account market. This means that for many of us, these banks are all we know. To help us answer the question we’ve used the Value Disciplines Model, see the geeky bit below if you want to know more about this model. We’ve used your reviews and the Value Disciplines Model (Michael Treacy and Fred Wiersema). The model says that there are three key value disciplines for companies, Operational Excellence, Product Leadership and Customer Intimacy. Companies must choose one of the value disciplines and act upon it consistently. This doesn’t mean that the other 2 dimensions don’t matter, just that being ‘ok’ is enough. 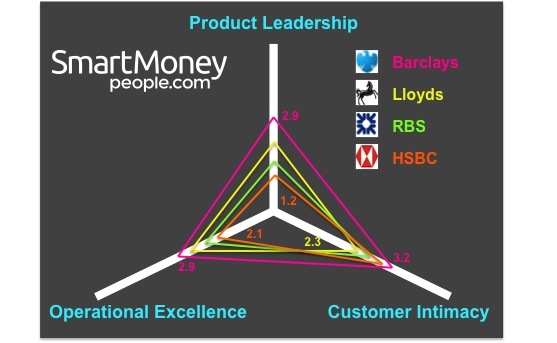 How does your bank or insurance company differentiate? Tell us by writing a review. Our mission is to increase trust and transparency in the Financial Services industry; to help make it work better for everybody. After just 4 weeks, your reviews are helping other customers to make better informed decisions.